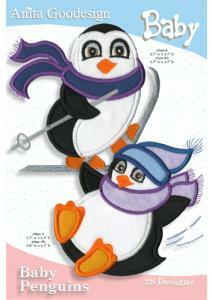 We created a beautiful wall hanging with the baby penguin designs. Instead of standard straight blocks we created a slash pattern as a background using pastel marbled flannels in shades of blue and lavender. We created the background first and then embroidered the penguin designs on it. You can place as many penguins as you like on it. Of course these designs would look beautiful on clothing as well. There is an additional tutorial on the CD-Rom that shows you lots of other ideas for baby quilts, and other projects as well as instructions on creating applique.